A clean car is a happy car! Give the gift of a clean car to a relative or friend with Spotfree’s convenient refillable pre-paid car wash gift cards that can be used in our touch-free automatic and self-service bays. Please select Gift Card Dollar Amount and the location of your choice. *Gift Cards Must Be Used at Your Specified Location. Contact us to change location. 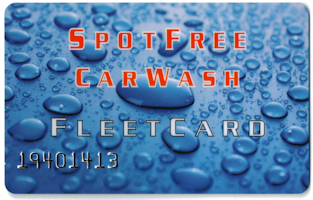 Spotfree car wash gift cards are available in denominations of $25, $50, $75 & $100 with additional credit issued. Gift cards can be used to purchase the wash package of your choice in the Touch-Free Automatic bays. In the self-service bays, swipe your card and the equipment is activated. Credit is deducted from your card as you wash until the STOP button is pressed, and then the total amount used is shown on the screen. Gift cards can be ordered here and mailed directly to you or sent as a gift to someone else. Please allow 3-5 business days for processing and mailing. Gift cards can also be re-loaded with new credit: REFILL YOUR GIFT CARD HERE. $25 purchase adds a $30 credit to the card. $50 purchase adds a $60 credit to the card. $75 purchase adds a $90 credit to the card. $100 purchase adds a $120 credit to the card. Account balances can be requested by e-mailing us your card number. Requests can be made Monday-Friday and expect 24 hours for a response.